An old diagrammatic sign posted at the Chesapeake House Service Area directing traffic from the parking area to the northbound mainline. The Chesapeake House closed for reconstruction in September 2012. It reopened as a modern facility on August 5, 2014. Photo taken December 21, 2012. Traveling 109.65 miles across the state of Maryland, Interstate 95 enters the state along side Interstate 495 across the Woodrow Wilson Bridge over the Potomac River. The Interstate encircles Washington, DC along the eastern half of the Capital Beltway before resuming a northeastern heading to Baltimore. Through Maryland's largest city, I-95 takes the tolled Fort McHenry Tunnel, which consists of four two-lane tubes below the waters of Northwest Harbor. Leaving the city, Interstate 95 follows the John F. Kennedy Memorial Highway, which first opened in 1962 as the Northeast Expressway, a toll road connecting Baltimore with the Delaware Turnpike. The John F. Kennedy Memorial Highway extends east into Delaware along the Delaware Turnpike to Newport. Both the Delaware Turnpike and Maryland John F. Kennedy Highway were primarily opened to traffic on November 14, 1963. The highway was dedicated by President John F. Kennedy on that day as the Northeastern Expressway; as fate would have it, his appearance at the dedication ceremony occurred just prior to his assassination in Dallas, Texas. The highway was renamed in his honor in 1964. Tolls along Interstate 95 include $4.00 per passenger vehicle at the Fort McHenry Tunnel and $8.00 per passenger vehicle along northbound at the Millard J. Tydings Bridge over the Susquehanna River. These rates went up from $3.00 and $6.00 respectively on July 1, 2013. 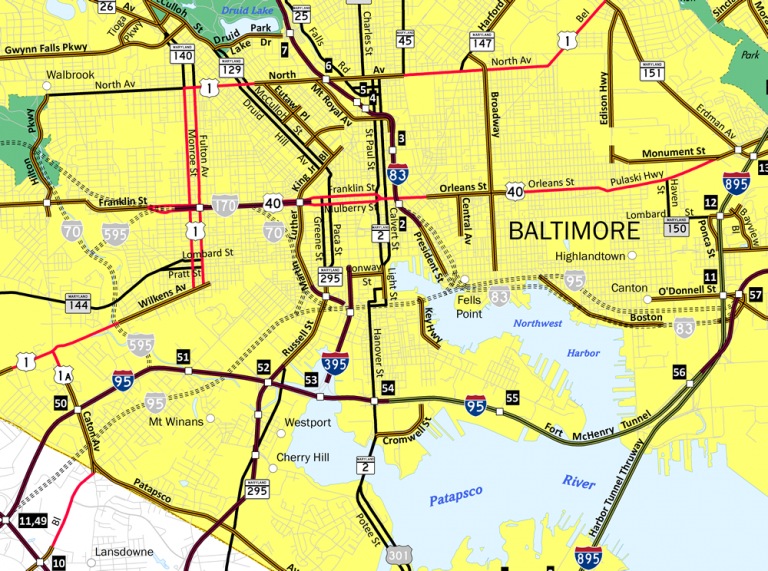 Interstate 95 was initially planned to travel a more northerly path through the city of Baltimore. The east-west alignment was projected south of the Inner Harbor and east through Fells Point, with Interstates 70 and 83 ending directly with the freeway. Interstate 595 was a circuitous freeway spur envisioned for a portion of the Interstate 70 corridor northwest to the existing Interstate 170 freeway. This was dropped when plans for new freeway construction failed outside of what was already built between U.S. 40. Northbound Maryland 210 at Interstates 95-495 south over the Wilson Bridge into Virginia. Maryland 210 continues north into Forest Heights before entering the District of Columbia. Photo taken 10/15/01. Maryland 202 (Landover Road) westbound on the one half mile approach to its three-quarter cloverleaf interchange with Interstates 95 & 495 (Caiptal Beltway). McCormick Drive intersects the state route ahead. Photo taken 08/01/05. Westbound Maryland 202 (Landover Road) at the northbound on-ramp to Interstates 95 & 495 to College Park and Baltimore. A left turn connects drivers with the eastbound on-ramp to the Capital Beltway south to Andrews A.F.B. and Forest Heights. Photo taken 08/01/05. This side view of the Interstate 95/395 stack interchange, taken from from Swann Park near Maryland 2, shows that the interchange is largely over the harbor. Photo taken 06/08/97. Eastbound Maryland 155 approaches the northbound on-ramp for Interstate 95 north to Wilmington, Philadelphia and New York. Photo taken 04/30/04. Text-based button copy sign posted for the Harbor Tunnel Thruway on O'Donnell Street Cutoff westbound at the Baltimore Travel Plaza. This sign predates the designation of Interstate 895 on the toll road, a signing that did not occur until the 1980s. Photo taken 07/09/10. Approaching the intersection with Interstate Avenue. Interstate Avenue joins Boston Street west with Interstate 95 at O'Donnell Street. Photo taken 07/09/10. Interstate Avenue sees a half diamond interchange with Interstate 95 for interests southbound to downtown and Washington to the left. Photo taken 07/09/10. All guide signs for Interstate 95 posted along O'Donnell Street Cutoff west, including the overhead at Interstate Avenue, were removed and replaced by October 2012 with a single panel directing traffic to I-95 via Interstate Avenue. Photo taken 08/04/13. An Interstate 895 trailblazer was added ahead of Interstate Avenue for the O'Donnell Street loop ramp onto the Harbor Tunnel Thruway south. Photo taken 08/04/13. The northbound ramp to Interstate 95 departs from O'Donnell Street and Interstate Avenue nearby. Photo taken 07/09/10. 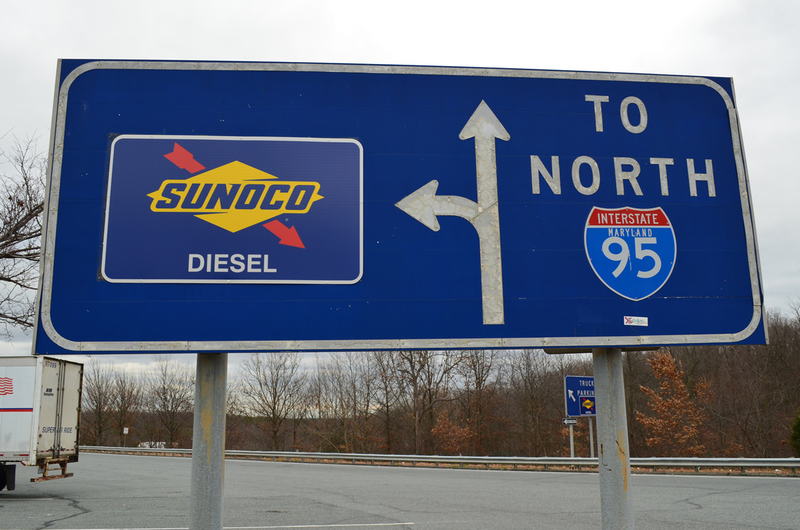 Traveling Interstate Avenue north between O'Donnell Street Cutoff and O'Donnell Street, an original button copy sign directed motorists back to Interstate 95 north from the adjacent Baltimore Travel Plaza. Photo taken 07/09/10. O'Donnell Street intersects Interstate Avenue and the northbound on-ramp to Interstate 95. Photo taken 07/09/10. State-named shield for Interstate 95 directing motorists bound for Interstate 95 southbound onto Interstate Avenue for its half diamond interchange with the freeway. Partially visible above is a stub that was intended to carry drivers from Interstate 83 south onto Interstate 95 north. Photo taken 07/09/10. O'Donnell Street passes under Interstate 95 and immediately meets Interstate 895 (Harbor Tunnel Thruway). A loop ramp provides access to the southbound toll road. Photo taken 08/04/13. Traffic to Interstate 895 (Harbor Tunnel Thruway) leaves O'Donnell Street west ahead of the signalized intersection with Ponca Street. Photo taken 07/09/10. O'Donnell Street passes under Interstate 895 (Harbor Tunnel Thruway) and splits with O'Donnell Street Cutoff east to Boston Street. An on-ramp joins I-95 north directly ahead, while interests to I-95 south should take O'Donnell Street Cutoff to Interstate Avenue. Photo taken 08/04/13. Trailblazers for Interstate 95 direct motorists onto Interstate Avenue from O'Donnell Street Cutoff east beyond the I-95 viaduct. Photo taken 08/04/13. A button copy sign at the intersection of O'Donnell Street Cutoff east with Interstate Avenue. Interstate Avenue west becomes Boston Street west of I-895 and Ponca Street while O'Donnell Street Cutoff east directly transitions into Boston Street east. Photo taken 08/04/13. South of O'Donnell Street Cutoff, Interstate Avenue enters a half diamond interchange with Interstate 95. Photo taken 08/04/13. An on-ramp provides access to Interstate 95 south from Interstate Avenue for all interests along O'Donnell Street, Boston Street and the former Baltimore Travel Plaza. I-95 south immediately reaches the Fort McHenry Tunnel Toll Plaza. Photo taken 08/04/13. A self-storage unit driveway ties into the southbound ramp for I-95 on Interstate Avenue. Interstate 895 (Harbor Tunnel Thruway) passes overhead just to the west, trading places with I-95 as both head south toward their respective tunnels. Photo taken 08/04/13.